NCERT Recruitment notification has been released for filling up various teaching positions under direct recruitment for Demonstration Multipurpose Schools attached to their Regional Institutes of Education all over India. These posts are transferable amongst the constituent units of the Council located in Ajmer, Bhopal, Bhubaneswar & Mysore. Eligible candidates can apply online through www.ncert.nic.in. Applicants can download the NCERT Admit Card 2016 for AMH, PGT, TGT, PRT, WET Recruitment Exam 2016 from this page. 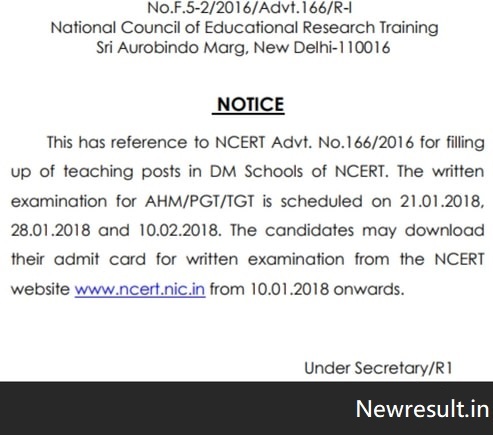 Get here complete details of NCERT Recruitment for AMH, PGT, TGT, PRT, WET such as notification, vacancy, eligibility, application form, hall ticket (admit card), exam pattern, result. Latest: The Admit Card for TGT, PGT, AHM has been released, download it from the “Admit Card” page link given in quick links. 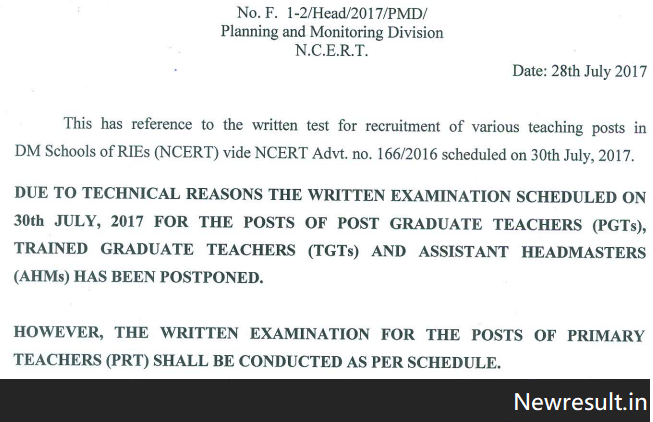 Candidates who had applied for PGT, TGT, AHM posts can now appear for exam as per new schedule. As can be seen from the notice below, PRT exam was held as per schedule. Its result could be announced any time. Master Degree from a recognized University with atleast 50% marks in aggregate in the relevant subjects. Bachelor’s Degree with at least 50% marks in the concerned subjects/ combination of subjects and in aggregate. The elective subjects and Languages in the combination of relevant subjects. Competence to teach through Hindi & English medium. Three years Diploma after Higher Secondary in relevant trade from an Institution recognized by State Govt./Govt. of India. Selection Process – Selection will be made on the basis of Written Examination and Interview. How to apply – Candidates are required to apply online through the NCERT website www.ncert.nic.in at Announcement Vacancy Academic. Eligible and interested candidates would be required to apply only online through NCERT website (Announcement-Vacancy-Academic) www.ncert.nic.in. Before applying for the post, the candidates must have a valid email id through which he/she will register with the online application portal. Candidates should fill in the details to register and then fill the information in the online application form at the appropriate places very carefully as per the instructions available on the website. No other means/mode of application will be accepted. Before applying the candidates should ensure that they fulfill all the eligibility norms. The written examination will be conducted in Delhi city only. Schedule of examination will be displayed on NCERT website separately. Candidates are requested to visit on NCERT website regularly. The name of the shortlisted candidates will be displayed on the website of the Council. These candidates will be called for interview / written examination and the call letters will be sent separately. Final result of the selected candidates will be displayed on NCERT website. The Council will not enter into correspondence with the candidates about reasons for their non – selection in the recruitment process. Interim inquiries will not be entertained. The relaxation in respect of candidates belonging to C/ST/OBC(NCL) category is provided in accordance with the KVS/GOI/NCERT rules.